Q. Where does cIOS install? A. It installs on the NAND flash of your Wii. It uses IOS249 v6. Q. Is this easy to uninstall if I decide I dont want it ? A. Yes – most of the install files can be removed with the WAD manager – the rest just delete off the SD card. Q. I’m getting an error with : DVD Identify Failed when I try to run a game – why ? Q. I don’t have Wi-Fi, how can I install it? Create the directory /00000001/00000024/v1042/ in the root of your SD card. Copy all downloaded files to this folder and put the SD card in the front SD slot. A2. When you have a second Wii with Wi-Fi, you can run the cIOS installer there with a SD card inserted. The software will copy the required files to the SD card while installation. Q. My game doesn’t start. What should I do? A. Try to change the hook type to GC in the configuration. 2. Load Backup Launcher and play game. A. Play Wii backups on your non-modded Wii. Q. Do all games work? A. This is only a beta version. Not all games will work, but as of now most do. Q: Where do I get support for it? A: I do this in my free time. So you need to search in the internet for forums like http://gbatemp.net. Q: Where do I get an update? Q: When will it support … and when will be released? A: I do this in my free time, so I don’t know. A: I heard a rumour that …? Q: Don’t believe it. Wait until it is approved or declined. Q. What does patched games means and do I need it? A. This was used in the first version. The game application was decrypted. It is not needed anymore. 1:1 backups have higher compatibility than patched games. Q. How do I run it? – You need to install http://www.wiibrew.org/wiki/Homebrew_Channel. – You will need http://www.wiibrew.org/wiki/Twilight_Hack and the game “The Legend of Zelda: Twilight Princess” to install the channel. – Create the directory apps in the root of your SD card. – Copy Backup_Launcher and cIOS_Installer to the directory apps. – Put the SD card into the front SD slot of your Wii. – Then run the homebrew channel. – First install cIOS and then run Backup Launcher. Q. I can’t install cIOS, I keep getting an error. How do I fix this? try to install the new cIOS. Q. Do I need the new cIOS to play games? A. Yes, some games have been tested and they work. Though we’re not sure if all of them work. Q. I have a problem, will you fix it? A. Post it in the Backup Launcher thread and beta testers or someone can help you. A. You have already something what you can test. Q. Will this brick my Wii? A. There is a slim chance that it will. I have installed the cIOS countless times with no problems. But just make sure you follow the onscreen instructions. It is possible that someone puts malicious software on a game disc. I suggest to run only games which are correctly signed by Nintendo! You can check this for example by running extractpartition. Don’t install updates from a burned game disc of a different region, this was already reported to brick your Wii, when using a hardware modchip. Q. ＜Insert Game Here＞ doesn’t work, whats the problem? A. The loader isn’t perfect. It will probably be fixed in the next update. Q. Does it load GameCube backups? Q. Does it play old games like Twilight Princess and Red Steel? A. No, but some are working. Q. Do I need dvdx? A. No. Just ignore it and forget that it could be in anyway related to this program. Q. There is a online or disc update available from Nintendo, should I update it? A. NEVER MAKE ANY UPDATE FROM NINTENDO!!! This can make the backup launcher unusable. There are better ways to do this. This is the release of a test version of the backup launcher. It runs stable for most games. I hope someone can make a compatibility matrix in the wiki. Please provide some good input data. Don’t ask questions which are already answered. If you didn’t use it before, you should check the posts for the old version. Please put test results here. If you have problems with the archive, you may rename it from .tgz to .tar.gz and extract it twice. – Drive speed is still 3x. It is so fast that some testers believed it is running at 6x. – Not all games will work, but as of now most do. Some parts are modification of free available source code, and are unsupported and not condoned by the original authors of it. 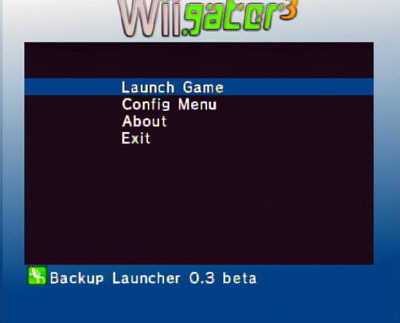 The backup loader modification is solely the work of WiiGator. Thanks to Waninkoko for his support and the first version of the backup loader. Before you use the software check if this is the offical version by comparing the hash values. It is prohibited to use any of the software to illegally copy games, they are intended only to create and play legal backups of games that you own. In some countries or regions it is still illegal to make copies of games that you own, check with your local authorities if you are unsure. I cannot be held responsible for any misuse of these programs. The use of any of the above software is done so at your own risk. If you mess something up or anything undesirable (ie: loss of warranty, brick, lawsuits, jailtime) happens because of any of these programs, it is your own fault. USE AT YOUR OWN RISK!!!! Just a little update to the fatmsmod patch, it stopped working in 5.00 due to a sony file changing its name. I guess fatmsmod.prx from firmware 3.71 is still the recommended memory stick driver of choice. And thanks to Dark_AleX, you can now enable the 3.71 driver under custom firmware 5.00 M33. decrypt 3.71 using psardumper (square option). copy fatmsmod.prx to the root of the memory stick. copy FATMS371 to /PSP/GAME or /PSP/GAME5XX and run the program.